Long Island seniors events for active seniors on Long Island, New York who know how to keep the good times rolling with activities for the body, mind and spirit. Long Island seniors events, seniors workshops, seniors classes, art, fitness, recreation, activities for seniors, seniors games, seniors hobbies, seniors news, senior citizens events, AARP events, fun events for seniors on Long Island, New York. 7 In Heaven Long Island Singles Speed Dating Women 54-67 Men 57-69 April 2019 at Half Moon Bar and Grill in Long Beach, Nassau County, Long Island, New York. 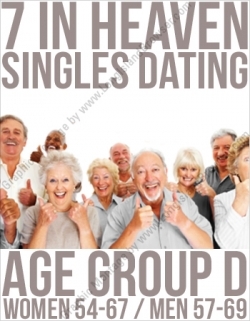 7 In Heaven Long Island Singles Speed Dating Women 54-67 Men 57-69 May 2019 at Cinque Terre Italian Restaurant in Huntington Station, Suffolk County, Long Island, New York. Tags: Long Island seniors events for active seniors who know how to keep the good times rolling with activities for the body, mind and spirit. Long Island seniors events, seniors workshops, seniors classes, art, fitness, recreation, activities for seniors, seniors games, seniors hobbies, seniors news, senior citizens events, AARP events, fun events for seniors on Long Island, New York.